Brick has been in use for at least 12 centuries. Brick manufacturing has changed from hand packing clay, water and other fibrous materials into shape, then air drying them, to the much more advanced technique of large mixing chambers using clay, water, and other materials which are closely controlled. The clay is forced through a form to make a 10 ft. +/- tall brick. The “brick” is then textured on the surface with sand and colorants, which are pressed or embossed into the face of the brick. The tall brick is then moved and pushed thru wires cutting it into standard brick size. Bricks are then layered on a kiln car (oversized rail car). The car is moved into a drying room. When the moisture is at its optimum level the car is moved into and through the kiln firing the bricks into their final hardness. The bricks are stacked and banded into cubes to be sold. Brick are bonded together using mortar. Mortar is a mix of portland cement, lime, sand and water. 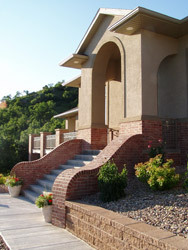 Mortar coloring may be added which can have a significant visual impact on the colors and contrast of materials used in the project. Wilen Masonry, Inc. would like you to consider mixing brick, block, stone and/or EIFS for a strong or subtle visual impact in your project. Call us at 605-892-0150 for more information.